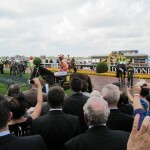 Derby Day – the greatest day’s racing on earth. And the weather looks awful. I’m just about to head out the door when the skies clear and I grab the straw hat for its first workout of the spring. My optimism is rewarded with a beautiful day. The track is a borderline Dead 5, but I still manage four bets for two collects (Niwot and Induna) and two losses (Efficient and Ego’s Dare). A positive start to a big week. Nothing to photograph with all the men in dark suits and funereal ties and all the women wearing black and white outfits from David Jones. Hopefully there will be more colour and movement on Tuesday. 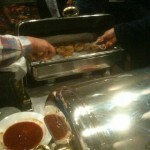 I did see some hock protectors, which are most unusual, and I did see two people who had passed out early. Don’t they realise this is a week for stayers? There are still three days to go. I’m off to the AGM again. This year it’s in the Grand Ballroom of the Sofitel Hotel. I’m a bit worried about how my shares are going now that Tabcorp has jettisoned its casino business. And I’m keen to compare the quality of the refreshments on offer with last year at the Tennis Centre. Those lamb cutlets were something special. It seems to be good news and bad news. They’ve retained the Victorian wagering licence for 12 years, which is good. But it cost them $410 million which is a worry when predicted EBITDA for FY14 is $120 million. So it will take 3-4 years just to pay it off. And the competition from the corporates is a worry, with market share now down to 43%. But taking them on with Luxbet is good. And they are in the Federal Court appealing the decision to allow internet betting terminals in pubs, which is a worry. But they’ve got the Victoria Keno licence for 12 years which is good. 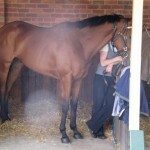 And the Betfair case in the High Court is a worry, but the take up of Trackside in NSW is good. Good news, bad news. Worry, worry. I’m mainly confused. The share price is struggling and is not much above the $2.25 original float price in 1994. But if you look back at 1992/93 wagering revenue was $296.5 million. 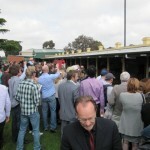 Wagering revenue in the first quarter for 2012 was $394 million, equivalent to $1.58 billion for a full year. So wagering has grown some five times in 20 odd years. Maybe I should buy some more. But there are more shares on issue so earnings per share have probably lagged wagering growth. Maybe I shouldn’t. I ponder imponderables over ham sandwiches and party pies for lunch. The pies are popular and not too bad at all. But not a patch on lamb cutlets. 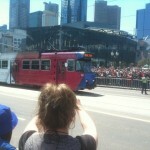 As penance for overindulgence I decide to walk back to Flinders Street station where a large crowd has gathered. Her Majesty has decided it is time to board the Royal Tram. I saw her passing by. I wonder if she’ll get party pies for lunch at Guv House? Weather science has definitely improved. I was running out the door when I quickly checked the forecast. Rain was predicted for 12 noon, then clearing to be followed by thunderstorms late afternoon. I grabbed the anorak. And right on cue it starts to pour at 12 noon and puts a dampener on the whole day. Not that I get enthused about Moonee Valley and the Cox Plate any more. The club seems to enjoy upsetting its members and the local community with its development plans: a new track, retail and commercial precinct, high rise towers, and a shift to predominantly night racing. 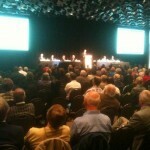 There is hardly any value in membership any more with only a handful of day meetings. The club is obviously aware of this and tries to soothe my feelings with a free racebook and drink voucher. The crowd is going crazy over the exhibition gallop by Black Caviar, but I find it hard to fire up. With only four runners there is no place betting. 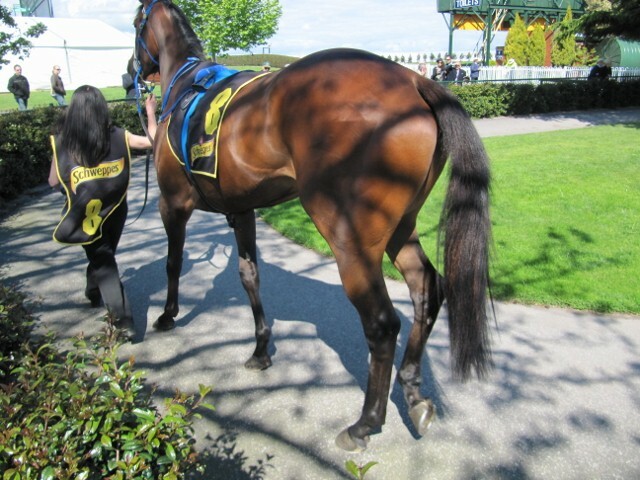 Not like last year when I managed to back Hot Danish for a good collect for running second to the champ. And I don’t bet on the Cox Plate any more. 5.35 pm? The committee should be lynched. 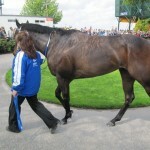 I’m saving myself for Hi Belle in the last, the mares race. The thunderstorm threatens and the lights come on in the mounting yard. The first Cox Pate to be run at night! Pinker Pinker plucks the plate. The thunderstorm arrives on cue and the mares race, listed at 6.20 pm, is postponed. I have my free drink, miss the mares, and head home early. Early but late. Sourpusses need to sleep at night. I see Hi Belle got second. So much to see, where to look. Panhandle has rarely observed pastern protection, which doesn’t seem to stop her doing her block and tossing the jockey in the yard. My first airborne jockey for the season. I suppose at 100/1 it wasn’t much of a chance anyway. 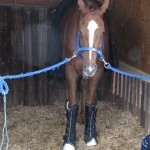 And the flowerpot on Sabrage is a worry, especially if you are the strapper. But the horse wins with a strong run from the back. 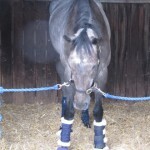 But it’s the cup horses I’ve come to see and I’m keen to have a good look at the internationals. They seem to be dominating the cup these days. Manighar is occupying himself with a little lip flipping stereotypy, Mighty High is a bit mad and sports ear muffs to prove it, Saptapadi is pawing and showing off his plaited mane, Green Moon is totally at peace with the world, and December Draw has the nose roll and is being saddled, backside out. 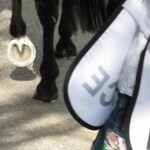 Lucas Cranach has the bruised foot issue and is sporting bar plates. I manage to fluke a photo! The locals look better. 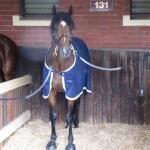 Southern Speed is totally relaxed and Tullamore is fit, relaxed and hand held. My final selections: Southern Speed, Saptapadi, Green Moon, Niwot, Tullamore and Hawk Island. 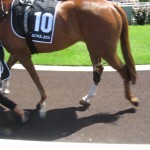 I back Southern Speed for the place and get back what I had given away on two previous races. I leave the track as I entered it, but at least my body and my money has had some exercise. I really should go for a trifecta in these big races. Atlantic Jewel looks a standout. But $1.04 for the place seems to be worse than bank interest, don’t you think? 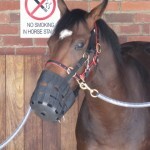 Besides, I’ve taken a shine to Sharnee Rose, lobbing around the parade ring with her tongue hanging out of her mouth. She’s a maiden, but she doesn’t know that! And her place form is outstanding with four places from four. I’m feeling pretty pleased with myself when she hangs on for third, five lengths from the standout. But $4.10 is infinitely better than $1.04, don’t you think? My second bet for the season. I’m easing myself into the spring. My first day back after four months off. My head is carrying a dull ache, maybe from too much holidaying, and my eyes and nose are streaming with hay fever, which is probably appropriate for the start of the spring. I felt a bit better once I caught a glimpse of Francesca, although it does look like she’s living on lettuce leaves. Every red-blooded male over 50 seems to lust after her and I must confess to some slight lasciviousness. But then it was reported to me that she has been observed smoking, so I crossed her off straight away. 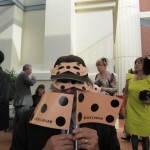 There is a large crowd here all wearing silly masks and waving Black Caviar flags. It’s impossible to get near the champ out the back and in the mounting yard everyone is holding up their mobile phone to take a snap. I finally decide to be a part of history and lash out for my first bet of the new season. 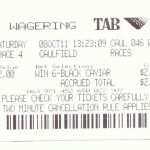 $2 to win on Black Caviar. I show everyone my winning ticket and boast that I am 20 cents up. I will keep the ticket for posterity and sell it on eBay in 50 years time for $50. It is then pointed out to me that I may not be around to collect and that I have in fact started the season $2 down. 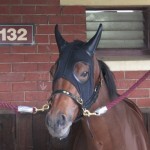 I finally got a photo of the champ out the back after the race looking very ordinary. 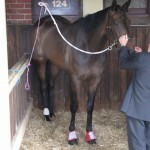 Most racegoers probably didn’t even realize that it was Black Caviar without her black spots and saddlecloth. I’m feeling very cautious because my eye is rusty as well as streaming. Descarado looked great, but I just watched. Helmet was impressive, but again I just watched. Finally, by the time the mares race came around I was ready to tip a tentative toe into the water and have a place bet on Celts. The bloke in front of me had $500 for the place on it, but I settled for much less. But nice to start the spring in front.